Being at Wondercon is a blast. Getting to WonderCon 2017 sucked. From our own experience to that of our friends and colleagues WonderCon makes us wonder why it left LA early with the new Anaheim Convention Center not finished and new parking lot unfinished. Forget leaving it either, who has a line for leaving? The lot was filled Friday, it wasn't so bad parking at the Honda Center's lot if you knew to go there first. However, by the end of the con it would be an annoying Hell to get back. Shuttles made parking at the Honda Center and Angel Stadium a breeze. You got on one and you got to the con. Or really the dropped you off at the Toy Story lot instead of right near the convention center. Who knows why? By the end, the shuttles were simply not big or fast enough for the amount of people leaving and this was Friday night. A long line formed for the shuttles that took 30-40 minutes from start to finish as the con ended. The shuttles also only ran until 9pm Friday. Now in the the dark, people waited; on their phones, talking about the con; their feet tired. The shuttles now cam back to their lots, but not at the same locations where people started. In the distance I saw Prince-the cosplayer-who I had been in with at the line earlier. He somehow was walking towards me from a distance. He was looking for his car. As I walked by him to empty parts of the vast lot I saw other lost souls looking for their ways home. From friends and other fans I heard tales of how bad their Saturday parking was. Shunned by the already filled Toy Story lot nearby, even when some were exhibitors and were suppose to get exhibitor parking, they had to head out the adjacent lots and then wait even longer to be part of WonderCon. When you know your location will be under construction you have to think about how hard it will be for fans, WonderCon team. Was the LA convention Center so bad or was their a better deal from the city of Anaheim? In any case, WonderCon really let down fans before they even got inside and as they were leaving. 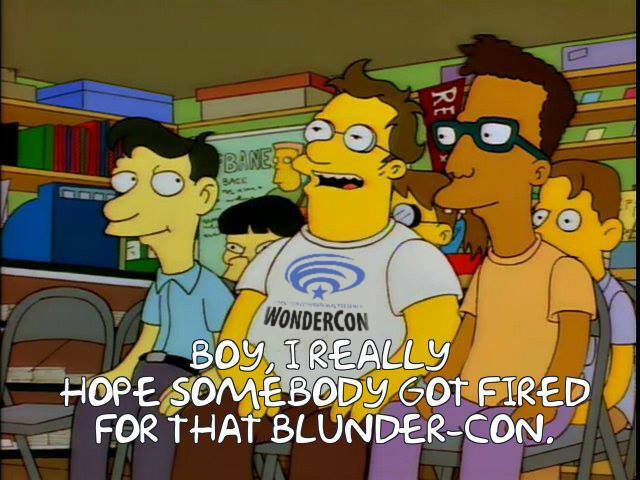 The con itself remains a pleasure for any fan or cosplayer...unless your trying to buy one of those WonderCon T-Shirts and the booth that only has two registers. Or if you're simply trying to drive down to it.